Find out more about the Lorex Listen-in Audio Camera and HD 1080p with features, pricing, and frequently asked questions. 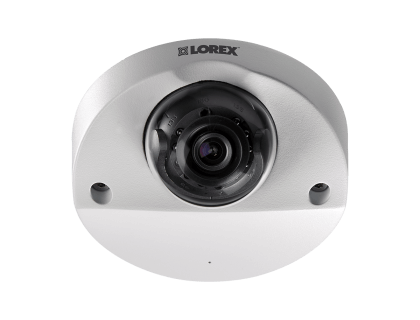 The Lorex Listen-in Audio Camera and HD 1080p is an indoor/outdoor Lorex security camera with built-in microphones for audio recording. The camera can be mounted on a wall or ceiling to capture video footage. 90 ft. maximum night vision range. Pros: Built-in microphone for audio recording. Heavy-duty exterior. Cons: Not universally compatible with all DVR systems. Bottomline: A functional and affordable security camera with a variety of installation options. 60 - 90 ft. / 18 - 27 m.
What are some alternatives to the Lorex Listen-in Audio Camera and HD 1080p? Where can I buy the Lorex Listen-in Audio Camera and HD 1080p? The Lorex Listen-in Audio Camera and HD 1080p is available on Amazon and on the Lorex official website. Does the Lorex Listen-in Audio Camera and HD 1080p work at night? The Lorex Listen-in Audio Camera is equipped with night vision that can see up to 90 ft. in ambient lighting and up to 60 ft. in total darkness. Can the Lorex Listen-in Audio Camera and HD 1080p be used in any weather? Yes, the camera is designed for outdoor use in any conditions and comes with an IP66 weather rating.